The 25th Asia-Pacific Dermatology Conference is going to be held at Osaka, Japan during October 09-10, 2019. 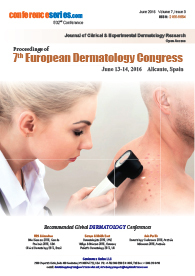 Through the theme: “Innovative techniques against major skin diseases and defects”, conference will explore the advances in Dermatology. It will be organized by ConferenceSeries Ltd. 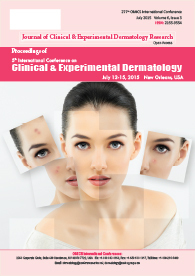 This conference could be an exceptional event that brings along novel and international mixture of giant and medium Dermatologists, leading universities and Dermatology establishments creating the conference an ideal platform to share expertise, foster collaboration across trade and world, and assess rising technologies across the world. The 25th Asia-Pacific Dermatology Conference will exhibit the products and services from commercial and non-commercial organizations like Dermatology Lab Equipment manufacturers, Cell Diagnostics laboratories, Clinical Trial Sites, Business delegates and Equipment Manufacturers. Why to attend Dermatology Conference 2019? Dermatology is the branch of medicine deals with the skin, nails, hair and its diseases.It concerns the study, research and diagnosis of normal skin and disorders of the skin An expert in the field of dermatology is a dermatologist. A dermatologist may be involved in medical or surgical treatments. Dermatologists also manage the cosmetic disorders of the skin, including hair loss, scars, and the skin changes associated with aging. Skin cancer and also malignancy of epithelial cells, Contact dermatitis, Kawasaki syndrome, infection, scars and rashes, Viral skin diseases.The skin is the largest organ in our body. Moreover, the entire surface area of the skin is visible, dermatologists have the advantage of direct visual examination. Dermatology - Cosmetology & Beauty, February 20-21, 2019 Dallas, USA,20th World Dermatology Congress, March 13-14, 2019,Holiday inn Singapore Atrium,8th International Conference on Cosmetology & Beauty Expo, April 17-18, 2019 Montreal, Canada,21st World Dermatology and Aesthetic Congress, April 22-23, 2019 Kuala Lumpur, Malaysia,25th International Conference on Dermatology, June 17-18, 2019 Osaka, Japan,9th Edition of International Conference on Cosmetology & Skin Care, June 20-21, 2019 London, UK,Asia-Pacific Dermatology & Cosmetology Conference, July 24-25,2019 Melbourne, Australia,Clinical and Experimental Dermatology, August 02-03, 2019 Chicago, USA,2nd International Meeting on Aesthetic Medicine, June 17-18, 2019 Osaka, Japan,10th International Conference on Dermatology & Cosmetology, December 07-08, 2018 Chicago, USA,14th International Conference on Dermatology and Cosmetic Medicine, April 18-19, 2019,Rome, Italy. Dermatopathology is specially focused to diagnose and observe the diseases of skin as well as infectious, medical specialty, chronic and neo-plastic diseases. Dermatopathology involves in the microscopic examination, description and interpretation of diagnostic assay specimens obtained from the skin. A dermatopathologist perform microscopic observation and also suggest the identification of the actual disease. The interpretation of skin specimens is difficult and tough, as the several various inflammatory skin diseases share identical basic inflammatory method or pattern. The ultimate identification needs clinical input and also clinicopathological correlation. In some cases, extra specialised testing must be performed on the biopsies, as well as technique, assay, microscopy, flow cytometry, and molecular-pathologic analysis. Pediatric dermatologists provide treatment for various skin conditions in children, including new-borns and infants. Children are not just small adults. They cannot express what is happening to them. They cannot answer medical questions, and are not always able to be patient and helpful during a medical exam. Pediatric Dermatologist a subspecialty of dermatology that provides the specialization in the diagnosis and treatment of the skin conditions in babies, children and adolescents. The impact of the abnormal skin irritations and conditions can result in feelings of emotional inadequacy in children. Pediatric dermatologists know how to, examine and treat children. It includes examination and waiting rooms that may have toys, videos, and books for children. In addition, pediatric dermatologists use medical equipment designed for children. 9th Edition of International Conference on Cosmetology & Skin Care, June 20-21, 2019 London, UK, 14th International Conference on Dermatology and Cosmetic Medicine, April 18-19, 2019,Rome, Italy, Aging, Health, Wellness Conference: For a better Aging Care, April 22-23, 2019 Kuala Lumpur, Malaysia, Asia-Pacific Dermatology & Cosmetology Conference, July 24-25,2019 Melbourne, Australia, Clinical and Experimental Dermatology, August 02-03, 2019 Chicago, USA, 2nd International Meeting on Aesthetic Medicine June 17-18, 2019 Osaka, Japan, 10th International Conference on Dermatology & Cosmetology, December 07-08, 2018 Chicago, USA, 14th International Conference on Dermatology and Cosmetic Medicine, April 18-19, 2019,Rome, Italy. A wound are often represented as an intermission within the continuity of the cells or something that causes cells that will usually be connected to become separated. Wound healing is that the restoration of the continuity. Many of the effects might result with the prevalence of a wound: immediate loss of all or a part of organ functioning, sympathetic stress response, hurt and curdling, microorganism contamination, and death of cells. The foremost vital consider minimizing these effects and promoting in care is careful asepsis, which might be accomplished mistreatment sterile techniques once treating a wound. Most non-healing wounds are not from trauma, infection, hospitalization, diabetes, poor circulation, surgery or alternative underlying health problems – heal with none downside. There are some unit risks factors in our lives and atmosphere, however, which will delay or stop the healing method. Wounds that fail to heal will diminish a person’s quality of the life and result in alternative medical issues. The Wound healing could be a complicated and also dynamic method of substitution devitalized and missing cellular structures and tissue layers. The human adult wound healing methods are also divided into three phases Inflammatory, Fibroblastic, and Maturation. Cosmetic medicine is one in which every of the foremost advanced side within the field of the medicine that options the follow of medicine that offers priority to the appearance of someone. The relevant medication and medical specialty surgery emphasizes the identification, treatment, and also bar of skin problem, there's a big side of the specialty directed towards rising the patient's look. Cosmetic dermatologists give medical and also surgical treatments to individuals with the issues like microorganism or fungous infections, aging, acne, sensitivity, unwanted hair, benign skin growths, and uneven skin pigmentation. Treatments that are related to the Advanced Dermatology (ADCS) range from the deep cleansing, refreshing, rejuvenating, and restoring skin texture and tone, to reducing skin imperfections. This session will cover all the aspects of the cosmetology and dermatology. 8th International Conference on Cosmetology & Beauty Expo, April 17-18, 2019 Montreal, Canada,21st World Dermatology and Aesthetic Congress, April 22-23, 2019 Kuala Lumpur, Malaysia,25th International Conference on Dermatology, June 17-18, 2019 Osaka, Japan,9th Edition of International Conference on Cosmetology & Skin Care, June 20-21, 2019 London, UK,Asia-Pacific Dermatology & Cosmetology Conference, July 24-25,2019 Melbourne, Australia,Clinical and Experimental Dermatology, August 02-03, 2019 Chicago, USA,Dermatology - Cosmetology & Beauty, February 20-21, 2019 Dallas, USA,20th World Dermatology Congress, March 13-14, 2019,Holiday inn Singapore Atrium. Portrait skin regeneration is not like other treatment offered nowadays. It’s the primary technology tested to deliver true skin regeneration. Whereas some of the treatments result in improved skin solely at the surface, clinically tested Portrait alters structures below the surface, making distinctive conditions for continued regeneration and enhancements in wrinkles, tone, texture and discoloration. Throughout the short procedure, the distinctive scientific action of Portrait transfers the plasma energy to the treated space while not direct contact to the skin. This system preserves the skin’s outer layers that act as a protecting dressing till new skin regenerates. Dermoscopy involves the observation of skin by the skin surface microscopy and in other words it is called as epiluminoscpy and epiluminescent. It examines the pigmented skin lesion. It is a non-invasive method that allows the in vivo evaluation of colours and microstructures of the epidermis, the dermoepidermal junction, and the papillary dermis not visible to the naked eye. Dermatoscopy needs a highly advanced magnifying lens as well as the powerful lighting system. . The use of this technique provides an valuable aid in diagnosing pigmented skin lesions. Because of the complexity involved, this methodology is reserved for the experienced clinicians. 9th Edition of International Conference on Cosmetology & Skin Care, June 20-21, 2019 London, UK,Asia-Pacific Dermatology & Cosmetology Conference, July 24-25,2019 Melbourne, Australia,Clinical and Experimental Dermatology, August 02-03, 2019 Chicago, USA,8th International Conference on Cosmetology & Beauty, Expo,April 17-18, 2019 Montreal, Canada,21st World Dermatology and Aesthetic Congress, April 22-23, 2019 Kuala Lumpur, Malaysia,10th International Conference on Dermatology & Cosmetology, December 07-08, 2018 Chicago, USA,14th International Conference on Dermatology and Cosmetic Medicine, April 18-19, 2019,Rome, Italy,20th World Dermatology Congress, March 13-14, 2019,Holiday inn Singapore Atrium. In recent past the technical innovations in medical specialty is sort of promising and it will take the analysis in medical specialty to a different level. A retrospective analysis of the clinical studies conducted before and once the introduction of absorbent gelling materials confirms that utilization of those materials has been related to a marked reduction within the severity of eczema. A review investigation of the clinical examinations led earlier and once the presentation of spongy gelling materials affirms that usage of those materials has been identified with a stamped diminishment in the seriousness of dermatitis. Recombinant deoxyribonucleic corrosive deoxyribonucleic acid|desoxyribonucleic acid|DNA (rDNA) atoms square measure DNA particles formed by research facility procedures of hereditary recombination, (for example, sub-atomic cloning) to heap up hereditary material from numerous sources, making arrangements that may or may not well be found inside the request. Recombinant deoxyribonucleic acid|deoxyribonucleic acid|desoxyribonucleic acid|DNA is possible because of DNA particles from all living beings share indistinguishable concoction structure. They differ exclusively inside the ester grouping among all that indistinguishable general structure. Asia-Pacific Dermatology & Cosmetology Conference, July 24-25,2019 Melbourne, Australia,Clinical and Experimental Dermatology, August 02-03, 2019 Chicago, USA,21st World Dermatology and Aesthetic Congress, April 22-23, 2019 Kuala Lumpur, Malaysia,25th International Conference on Dermatology, June 17-18, 2019 Osaka, Japan,9th Edition of International Conference on Cosmetology & Skin Care, June 20-21, 2019 London, UK,Dermatology - Cosmetology & Beauty, February 20-21, 2019 Dallas, USA,14th International Conference on Dermatology and Cosmetic Medicine, April 18-19, 2019,Rome, Italy,20th World Dermatology Congress, March 13-14, 2019,Holiday inn Singapore Atrium,21st World Dermatology and Aesthetic Congress, April 22-23, 2019 Kuala Lumpur, Malaysia,10th International Conference on Dermatology & Cosmetology, December 07-08, 2018 Chicago, USA. There are unit legion reasons for following the associate in nursing interest to try and do analysis in medicine. The skin is the most vital organ that provides itself to clinical analysis as a result of its visible and it's quite simple to try and do sampling. Medicine analysis may be a terribly huge field and stretches from the animal work and basic lab-based analysis on human samples to population-based studies. Within the recent time the analysis in medicine reach to a different height that includes basic science analysis, clinical analysis, new techniques to diagnose medicine diseases, new medical care and deliver treatment. 14th International Conference on Dermatology and Cosmetic Medicine, April 18-19, 2019,Rome, Italy,10th International Conference on Dermatology & Cosmetology, December 07-08, 2018 Chicago, USA,2nd International Meeting on Aesthetic Medicine, June 17-18, 2019 Osaka, Japan,Clinical and Experimental Dermatology, August 02-03, 2019 Chicago, USA,25th International Conference on Dermatology, June 17-18, 2019 Osaka, Japan,8th International Conference on Cosmetology & Beauty, Expo,April 17-18, 2019 Montreal, Canada,21st World Dermatology and Aesthetic Congress, April 22-23, 2019 Kuala Lumpur, Malaysia,Dermatology - Cosmetology & Beauty, February 20-21, 2019 Dallas, USA. Dermatology Conference 2017 could be an exceptional event that brings along a novel and International mixture of giant and medium Dermatologists, leading universities and Dermatology analysis establishments creating the conference an ideal platform to share expertise, foster collaborations across trade and world, and assess rising technologies across the world. 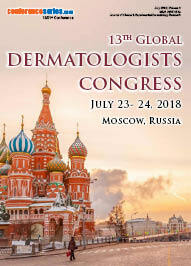 World-renowned speakers, the most recent techniques, tactics, and the newest updates in Dermatology fields are hallmarks of this conference. 19th World Dermatology Congress 2018 was held May 07-08, 2018 at Tokyo, Japan. Conference Series llc LTD played host to a diverse panel of key members of the Dermatology community from research lab, industry, academia and financial investment practices, discussing the future of Dermatology specialties. This event was really aimed for examining where the real Dermatological specialties are going in the future and purpose of the event was to provide an opportunity for cross fertilization of ideas and development of ideas, in the field of Dermatology. The conference aimed a parallel rail with theme “Recent Advanced Therapeutic Research and Modern Dermatological Techniques”. Focusing on Skin and Skin Disorders, Dermatological Diseases, Pigmentary Disorders, Hair Transplantation, Skin Rejuvenation and Resurfacing, Vereneology Diseases, Contagious Skin Infections as well, the 2 days of discussions enabled professionals to gain an insight into the current innovations and opened up networking opportunities. World Dermatology 2018 Organizing Committee members would like to thank the Moderators of the conference, for his contribution which resulted in the smooth functioning of the conference. The highlights of the meeting were the eponymous lectures. These talks were of great interest to the general Dermatologists and were enormously informative. 19th World Dermatology Congress 2018 was a great success with the support of international, multiprofessional steering committee and coordinated by the Journal of Clinical & Experimental Dermatology Research International Publisher of Science, Technology and Medicine Hair Therapy & Transplantation.